Feed articles via email, subscribe here..! 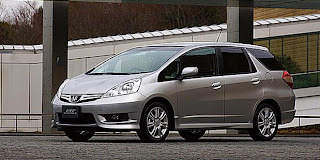 After being delayed three months because of natural disasters in March 2011, Honda Motor Company officially launched the Fit Shuttle or Jazz Wagon in Japan, 16/6/2011. Reuters reports, the Toyota Prius Alpha competitors are already getting orders from 7000 Honda customers. Honda offers this long Jazz in the two options. The first version, Fit Shuttle 15x (FWD) is equipped with a 1.5-liter i-VTEC engine with a fuel consumption of 20 km per liter and priced at 1.61 million yen. The second version, the Fit Hybrid Shuttle engined 1.3-liter i-VTEC plus IMA (Integrated Motor Assist) with a consumption of 30 km per liter gasoline and sold 1.81 million yen per unit. The third largest car manufacturer in Japan has been successfully reached the target, which is 4,000 units per month. Varian's top-selling hybrid in the composition is 90 percent. This is understandable considering that consumers tend to choose efficient cars as oil prices are more expensive. In its official statement, said that Honda Fit is still the format of the Shuttle 5-passengers, but with a more spacious luggage space and is also more convenient.